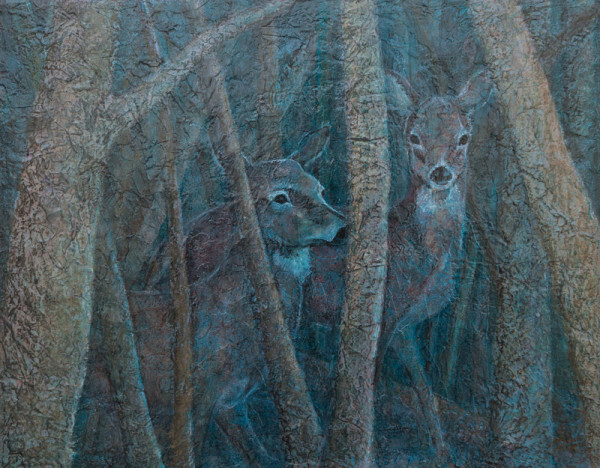 “In the Shadows” is a monochromatic Acrylic Layers and Collage painting I did of the deer I see outside of my window. They are so well camouflaged that I depend on my peripheral vision to detect their movement before I can actually see them among the trees. This painting was so fun to create! It started out with collaged pages from a local newspaper upon which I added layers of acrylic paint, acrylic gel, and charcoal. The resulting texture makes the trees jump off the surface and camouflages the does. I’m very pleased to have this painting juried into the Fredericksburg Center for the Creative Arts February 2014 Regional Juried All-Media Exhibit by juror Karen Stinnett.